Voice over internet protocol (VOIP) services are insanely popular worldwide. Services like Skype, Whatsapp, and Google Hangouts are essential tools for keeping in touch with friends and family in different countries. It’s also super convenient for free/cheap calls while traveling. But many VOIP converts are also using a new tool. A VOIP VPN (Virtual Private Network) to fix some of the most common complaints, including slow streams or outright blocking of VOIP streams. We assembled a list of the Best VPN Services for VOIP apps, as well as an excellent guide on setup and usage to get the most out of the service. There’s a few features that are more important when you’re choosing a VPN for Skype or other voice chat apps. So here’s our list of recommended VPN companies that fit the bill. IPVanish was an easy top choice, since they’re consistently rated among the fastest VPN companies in the world. Price-wise, they’re middle of the pack with plans ranging from $6.49 – $10 per month with unlimited bandwidth. IPVanish now has servers in over 70 countries worldwide, so odds are they’ve got a location near you and the people you call most. Their VPN Software is easy to use and available for iOS/Android/PC/Mac platforms. 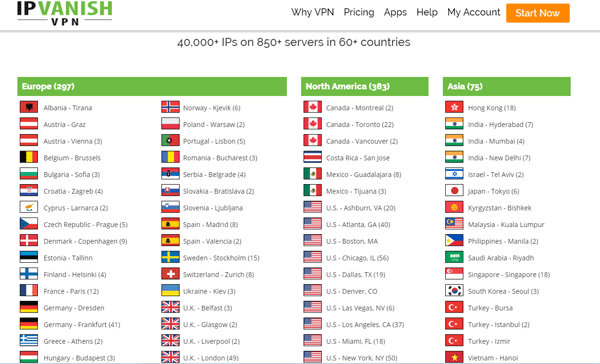 VyprVPN is one of the oldest VPN companies in the USA, and like IPVanish, they’re known for speed. And Vypr has one even bigger selling point. Their software. It’s outstanding. Seriously, their VPN app is head-and-shoulders above the competition. And of course Vypr fully supports all popular voice and video chat protocols, including Skype, Viber, Whatsapp, Facebook Live and Hangouts. And they never monitor or log your vpn activity. Netflix Compatibility: Netflix blocks most VPNs, but Vypr works from anywhere in the world. Auto-connect on untrusted wifi: Never be insecure on public networks. Currently (as of publication) VyprVPN is allowing you to try their service for free (for 3 days), before committing to a paid subscription. That way you can see whether it’s the perfect fit for Skype, and your other security needs. We think it will be. Private Internet Access is one of the best low-cost VPN providers in the world. With over 1 million subscribers, they can afford to offer excellent service (and speeds) at cheaper prices than competitors. Their software is simple, but extremely stable and secure. And their app is available for all major platforms. You can even use PIA on your home router. And you’ll love their port forwarding feature which has awesome secret uses, like getting free in-flight wifi. PIA is fully VoIP compatible and they’re among the most pro net-neutrality companies in the world. In other words, you don’t have to worry about them throttling or blocking your Skype usage. With plans starting at $3.33/month, you’ll have to look hard to find a better deal. All plans come with a 7-day 100% refund guarantee. Skype, Whatsapp, Signal, and other VOIP apps are awesome, but not everybody thinks so. In fact there’s a whole bunch of people that would prefer they didn’t exist (or didn’t use so much bandwidth). Internet companies throttle VOIP or block it out right, and whole countries have repeatedly tried to restrict access, primarily to stifle free speech and the flow of information. A VPN is an effective weapon against bandwidth throttling, which can cause choppy audio, buffering video, or even disconnections. The Problem: Digital audio can use in excess of 1mbps on high quality streams, which is alot on 3G mobile networks or in certain countries. And many VOIP services (Skype for example) have fully embraced video streaming as the next evolution of VOIP technology. But Video uses exponentially more bandwidth than audio (up to 25x). Internet providers are notorious for throttling (slowing) high-bandwidth uses like video and VOIP. In fact, the latest generation of Unlimited Data plans here in the states all implement video throttling. Some even cap bandwidth at sub–HD resolution. Uncool. Why a VPN Helps: A VPN wraps all your transmitted data in a layer of unbreakable encryption. This prevents anyone (even your internet/mobile provider) from reading your traffic. If they can’t read it, they can’t throttle certain protocols (like video). Recommended: IPVanish VPN is great at bypassing throttling. Most VoIP services charge different fees based on the country you (and your conversation partner) are located in. The logic makes sense, as the VoIP service is transferring data further and may be connecting to legacy telephone networks in different countries. But for the most part, calls within the same country are totally free. And the beauty of a VPN is that you can ‘virtually’ live wherever that VPN has server locations. So if you want to call a friend in India, Mexico, Australia, or the USA just connect to a VPN server in those countries. It’s easy, and can save alot of money in connection fees. Recommendations: Choose IPVanish or ExpressVPN. They each have servers in more than 70 countries worldwide. Why a VPN Helps: The strong encryption of a VPN can protect against VOIP-blocking techniques like Deep Packet Inspection. And if your country blocks VPNs, then you can use a stealth VPN protocol to disguise the VPNs traffic, and slip through the firewall unblocked. We don’t always make Skype calls on public networks. Sometimes you’re sharing wifi with strangers, sometimes hundreds at a time (like at an airport, hotel, or conference). And do to the insecure nature of open wifi, someone could literally snoop on your VoIP traffic and watch or record your calls. A VPN can prevent unauthorized snooping. The Problem: Open wifi is insecure, and your calls may not be private. The Fix: A VPN wraps your Skype/VoIP traffic in a layer of unbreakable encryption, preventing anyone else from sniffing your traffic on non-encrypted networks. If you’re new to voice/video chat technology or aren’t sure which companies work best with a VPN, we’ve included our top recommendations. All of these VoIP services work great in conjunction with a quality VPN provider. Skype: Skype is the market leader and still the gold standard for web-based voice and video chat. Skype is 100% VPN-compatible. Owned by Microsoft, their app is available for all major platforms including: Mac, PC, iOS, and Android. And their security is much better than newer startups. Viber: Viber is one of the most popular video-chat apps in the world, largely because it’s free. It has cross-platform support, and instant messaging functionality in addition to voice/video chat. It has been dinged for privacy and security concerns however, receive 2 out of 7 from the EFF. Whatsapp: Whatsapp is the world’s most popular messaging service, and is currently owned by Facebook. It supports video-chat in addition to instant messaging. By default, whatsapp uses end-to-end encryption for all communications, and is one of the most secure messaging and voip apps available. And it’s free! Signal: Signal Private Messenger is one of the most popular encrypted messenger apps in the world. And it fully supports VoIP and video chat protocols for secure communications. It’s highly recommended by security professionals worldwide, and received a 7 out of 7 score from the EFF for security and privacy. Here are answers to popular questions about encrypting/unblocking VoIP with a VPN. If you have concerns we didn’t cover, just leave a comment below and we’ll answer it ASAP. How do you install/use the VPN for VoIP? There’s no manual configuration required in your Voice software. You don’t have to change any settings in Skype or Viber. Install the VPN software (you’ll get a link to download it after you subscribe). Which VPN protocol is best for VoIP? Most VPN clients will offer the choice of TCP or UDP connections. Some will also let you choose encryption strength (typically 128-bit or 256-bit). You should choose UDP, and 128-bit encryption if it’s available. UDP generally has faster speeds than TCP, letting you have better video resolution. Using the lower encryption strength will also add a bit of speed by reducing encryption overhead. Then the firewall/country probably also uses VPN-blocking technology. You may be able to sleep through the firewall by using an obfuscated VPN protocol (but it’s not a guarantee). VyprVPN and VPN.ac both include stealth obfuscation. 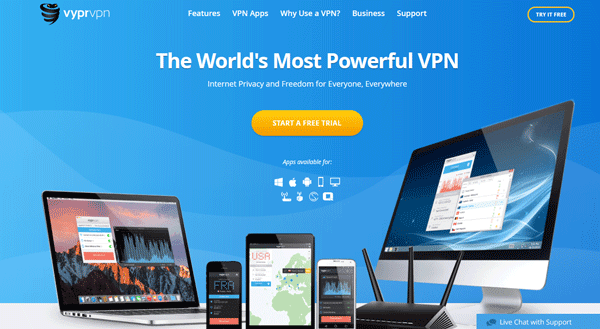 Will a ‘Free VPN’ work for VoIP? It depends what you mean by ‘work.’ Will you be able to connect to a VPN server and login to Skype or your VoIP app? Probably. But you may be shocked at how slow the speeds are. You’ll also be choosing from a much smaller list of server locations. It’s no secret that we don’t like free VPNs on this site. It’s because many have been found to have deficient (or non-existent) security. And the privacy tradeoffs (you are the product of a Free VPN) usually aren’t worth it. But if you’re dead set on it, Hide.me or Cyberghost are decent free options.